The autopsies were performed a week after the murders, on August 11, 1892. 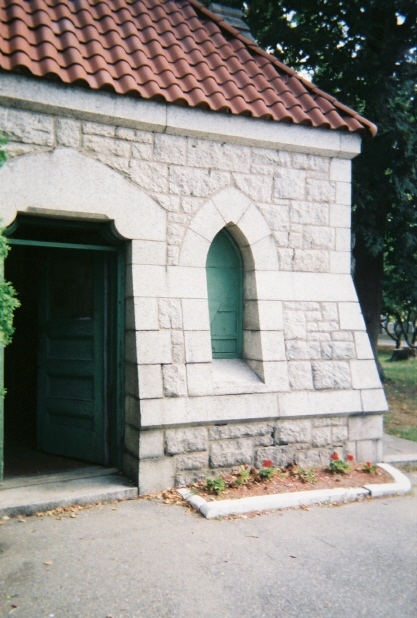 The bodies had been stored in the holding tomb after the funeral service graveside on August 6th. Dr. William Dolan, medical examiner, removed both skulls at this time to be saved for future evidence. The autopsies took place inside the main gate in the building to the left, which was called the Ladies’ Comfort Station at the time. Record of Autopsy held at Oak Grove Cemetery on body of Andrew J. Borden. Autopsy performed by W. A. Dolan, Medical Examiner, assisted by Dr. F. W. Draper. Witnesses F. W. Draper of Boston and John W. Leary of Fall River. Clerk D. E. Cone of Fall River. Time of Autopsy 11.15 A.M. August 11th, 1892, one week after death. Body that of a man well nourished. Age seventy years. 5 feet 11 inches in height. No stiffness of death on account of decomposition, which was far advanced. Inguinal hernia on right side. Abdomen had already been opened. Artificial teeth in upper jaw. There were no marks of violence on body, but on left side of head and face there were numerous incised wounds and one contused wound penetrating into the brain. Incised wound 4 inches long beginning at lower border of left nasal bone and reaching to lower edge of lower jaw, cutting through nose, upper lip, lower lip, and slightly into bone of upper and lower jaw. Began at internal angle of eye and extended to one and 3/8 inches of lower edge of jaw, beginning 4 and 1/2 inches in length, cutting through the tissues and into the bone. Began at lower border of lower eye lid cutting through the tissues and into the cheek bone, 2 inches long and one and 3/8 inches deep. Began two inches above upper eye lid 1/2 inch external to wound No. 3, thence downward and outward through middle of left eyebrow through the eye ball cutting it completely in halves, and excising a piece of the skull one and 1/2 inches in length by 1/2 inch in width. Length of would 4 and 1/2 inches. Began on level of same wound superficial scalp wound downward and outward 2 inches long. Parallel with this 1/4 inch long, downward and outward. Began 1/2 inch below No. 5, 3 inches in length downward and outward, penetrating cavity of skull. On top of skull was a transverse fracture 4 and 1/2 inches in length. Began directly above No. 7 and one inch in length downward and outward. Directly posterior to No. 8 beginning at ear and extending 4 inches long, 2 inches in width, crushing bone and carrying bone into brain. Also crushing from without in. Directly behind this and above it, and running downwards backward 2 inches long superficially. The general direction of all these wounds is parallel to each other. HEAD. Right half of top of skull removed. Brain found to be completely decomposed; and in fluid condition. CHEST. Chest and abdomen opened by one incision extending from neck to pubis. Right lung glued to ribs in front. Left lung normal. HEART normal. ABDOMEN. Spleen normal, kidney normal, liver and bladder normal. Stomach and portion of liver had been removed. Lower part of large bowel filled with solid formed feces. Feces also in lower part of small bowel. Record of Autopsy on body of Abby D. Borden, aged 64 years. Thursday August 11, 1892. at 12.35 P.M. One week after death. The Autopsy was performed by W. A. Dolan, Medical Examiner, assisted by Dr. F. W. Draper, and witnessed by F. W. Draper of Boston, and J. H. Leary of Fall River. Clerk of Autopsy D. E. Cone of Fall River. FIRST an incised wound 2 and 1/2 inches in length, and 2 and 1/2 inches in depth. The lower angle of the wound was over his spine and four inches below the junction of neck with body, and extending thence upward and outward to the left. On the forehead and bridge of nose were three contused wounds. Those on the forehead being oval, lengthwise with body. SECOND The contusion on bridge of nose was one inch in length by on half inch in width. Was a glancing scalp wound two inches in length by one and 1/2 inches in width, situated 3 inches above left ear hole, cut from above downwards and did not penetrate the skull. Was exactly on top of the skull one inch long penetrating into but not through the skull. Was parallel to No. 2, one and 1/2 inches long, and penetrating through the skull. Was 2 and 1/4 inches long above occipital protuberance and one and 1/2 inches long. Was parallel to No. 4 and one and 1/2 inches long. Was just above and parallel to No. 5, and one and 1/4 inches long. On top of skull was a traverse fracture two inches in length, a continuation of a penetrating wound. Was two inches long and two inches behind ear hole crushing and carrying bone into brain. All the wounds of the head following No. 7 though incised crushed through into the brain. These wounds on the right side were parallel, the direction being mostly from in front backwards. HEAL. There was a hole in right side of skull 4 and 1/2 to 5 and 1/4 inches, through which the brain evacuated in fluid condition being entirely decomposed. CHEST. The chest and abdomen was opened by one incision from chin to pubis. LUNGS bound down behind but normal. HEART normal. ABDOMEN, Stomach and part of bowel had been removed. Spleen, pancreas, kidneys, liver, bladder and intestines were normal. Womb was the seat of a small fibroid tumor on anterior surface. Fallopian tubes and ovaries normal. Lower bowel empty. Upper portion of small bowel containing undigested food.